These tributes to Ken were given by his three children during the funeral at St George’s on 15th September 2016. Dad was born and grew up in Sutton Bridge, a small village in Lincolnshire. He was a bright lad, and a village lad. He passed the 11+ a year early and gained a place at the Grammar school in Spalding. At the age of 10 he would get the train 16 miles each way to school, a fact he was very proud of and would remind us constantly. Dad did his National Service with the RAF and developed a keen interest in radios – this encouraged him to go on to study Electrical Engineering sponsored by GEC at Aston University. One night out at a dance in Birmingham - complete with black eye from rugby – he met his future wife Adina and undeterred by the black eye they married in 1962, and despite honeymooning in Torquay remained married for 54 years! Moving jobs to Plessey brought Mum and Dad to Hampshire from Northampton where they first settled in Cowplain and went on to have us 3 children; Derek, Russell and Lorna, 2 years apart. As the family grew, we moved to Waterlooville where they have lived the last 44 years. I’m not sure many of you know this but when Dad was only 35 he became seriously ill with Hodgkins, a cancer of the blood. Mum, with 3 kids under 5 was told he only had a 50:50 chance of survival, but as you know he did pull through. Who would have helped me so patiently to understand Maths A Level? Dad did, he always wanted me to do well. He inspired me to go into Electronics. And he gave me the confidence to do whatever I wanted to do. It was my Dad that did that. I was a true Daddy’s girl and that was a very special relationship and something I will miss every day of my life. I used to love having him to stay for weekends, it always felt like BONUS time, even with Alzheimers he enjoyed his fish and chips at the pub and a cuddle on the settee watching Sky Sports. Dad had a real passion for sport. As a young man he had a love for rugby, being team captain whilst he was at university. Trying to watch rugby on the tv with dad could be a tiring experience as he caught and kicked every ball with the team. 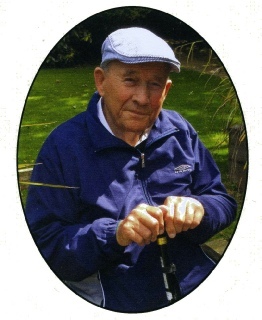 Cricket and table tennis also played a large part in his life where he had a long association with Cowplain CC and table tennis at Deverell Hall in Purbrook. Derek and I always remember a trip to Lords Cricket Ground with dad which sparked a lifelong love of cricket for myself. Dad could sometimes be a sore loser as I found out after I finally beat him at chess and won the £5 he had promised me for 5 years. In his later years, although suffering with Alzheimers he loved a game of dominoes. His eyes would light up and his competitive streak would come out again. Dad would take on all comers – and end up thrashing the lot of us, as plenty of you here know! Dad was incredibly resourceful and around the house would always be making, mending and doing things for himself from home brew to fitting his own double glazing and whilst I’d be roped in to hold something steady for hours it definitely rubbed off and has inspired me to be the same in many ways. I remember on one family holiday driving to Devon we had a car crash on a country lane which punctured the radiator and Dad managed to limp the car to a scrap yard where he fitted a radiator from a completely different type of car – somehow lashed it together - and we continued on our way. Dad was scrupulously honest, I couldn’t imagine him ever telling a lie or doing anything wrong, and he was loyal and dependable. I would never accuse him of spoiling us but he was there when we needed him and I don’t just mean the “bank of dad” which all three of us have used - I remember phoning him soon after I’d moved out saying “I’ve locked myself out what do I do?” and he was straight round to sort it out as he always did. Dad had Alzheimers for 5 years and latterly a terminal condition known as MDS but in the end his passing was quite sudden. In his last 48 hours it was pneumonia that took him and whilst we still have a sense of shock at how quickly it took hold there is also relief that he didn’t have a long drawn out suffering.